There are various fungi and insects that may affect forests. And susceptibility of our trees is increased by environmental factors like increased nitrogen deposition as e.g. bark beetles. Moreover, introduced parasites like Ash dieback are threatening our forests. Important parasites in our forests include spruce needle bladder rust (fungus), leaf scorch of oak (fungus), honey fungus (Armillaria sp. ), red rot of spruce (fungus), Scots pine dieback (introduced fungus), chestnut gall wasp (introduced insect). by the fungus Apiognomonia errabunda is increasing in abundance. Beetles and other small insects are important for the nutrient cycle of forest ecosystems. They are involved in the decomposition of wood and organic matter and thereby in the recycling of nutrients. 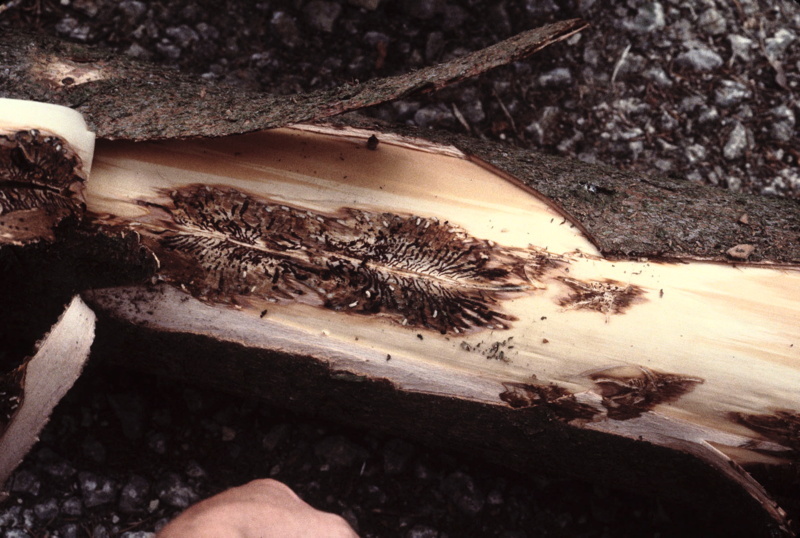 Bark beetles however are feeding on live wood. Usually it attacks only trees that are stressed by other factors. In mass reproduction events as they occurred after gale ‘Lothar’ in 1999 and after dry summers 2003 and 2011, beetles attack also healthy trees. 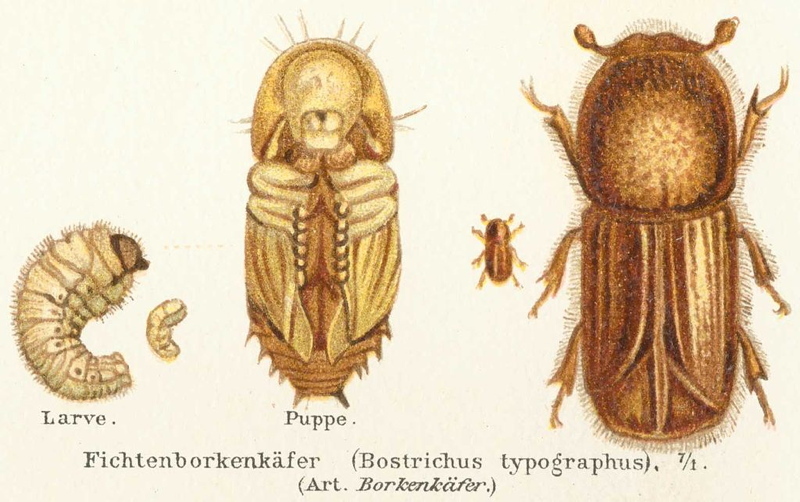 Left: Drawing of a bark beetle (Eight-toothed bark beetle) and its larva from 1888 (Wikipedia). Centre: Feeding traces of bark beetles underneath the bark. 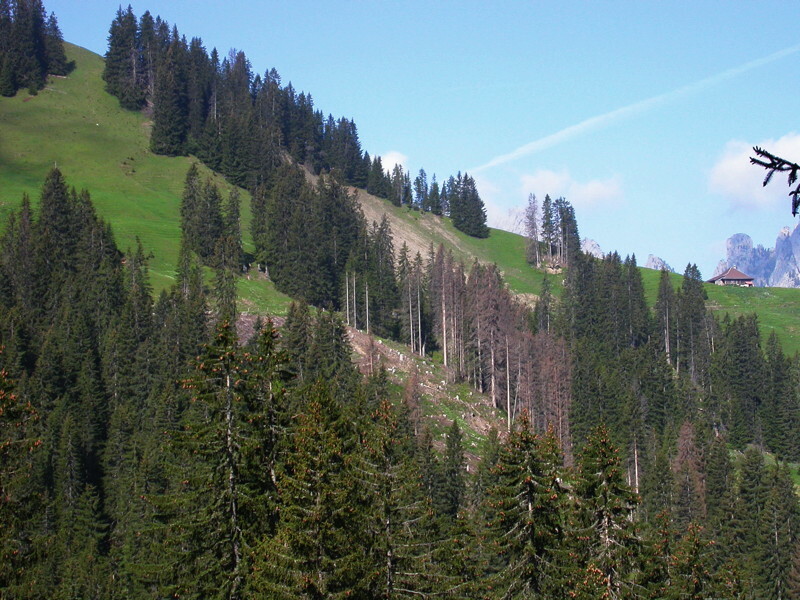 Right: Dead spruce by bark beetles on Jaunpass (BE). Actually, bark beetle populations are growing because of the extreme drought in 2015 and 2016. But also high nitrogen deposition and potassium deficiency in trees influence bark beetle attacks. There is a relationship between spruce mortality, drought, nitrogen deposition and nutrient concentrations in needles (see also chapter mortality). Ash dieback (Hymenoscyphus fraxineus) is a fungal disease that infests ash trees (Fraxinus excelsior L.) of all age classes via leaves and tree trunks and causes dieback first of shoots and later of the whole tree. The fungus originates from Japan where it is a harmless leaf litter decomposer. In 1990, the fungus was introduced to Poland from where it is spreading throughout Europe. It reached Switzerland in 2008. 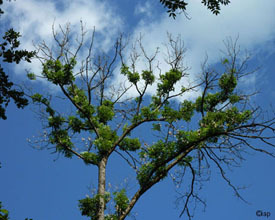 Left: Typical shape of an infested ash tree. It lost almost all its leaves and produces substitutive shoots. Right: A young ash sapling with wilting shoot. Spread of ash dieback in our permanent forest monitoring plots. 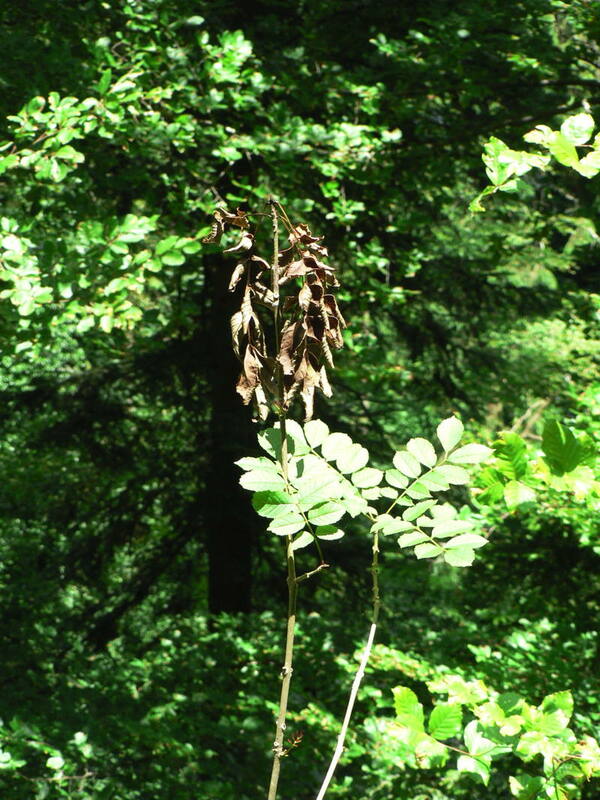 2013 the IAP started an ash dieback monitoring in Switzerland. The goal is to study the disease process in ash forest and to find tolerant individuals. The monitoring includes 201 trees on 22 plots. After the first year, already 47% of the originally healthy trees were infested. 2015, this number increased to 70% (141 trees). Also in 2016 the ash dieback monitoring showed a decline in symptom-free ash trees to only 31 trees (15.8% of 196 monitored trees in total). Still the majority (154 trees) is classified into the second defoliation class indicating early infestation. The total number of trees was reduced due to logging and storm damage. 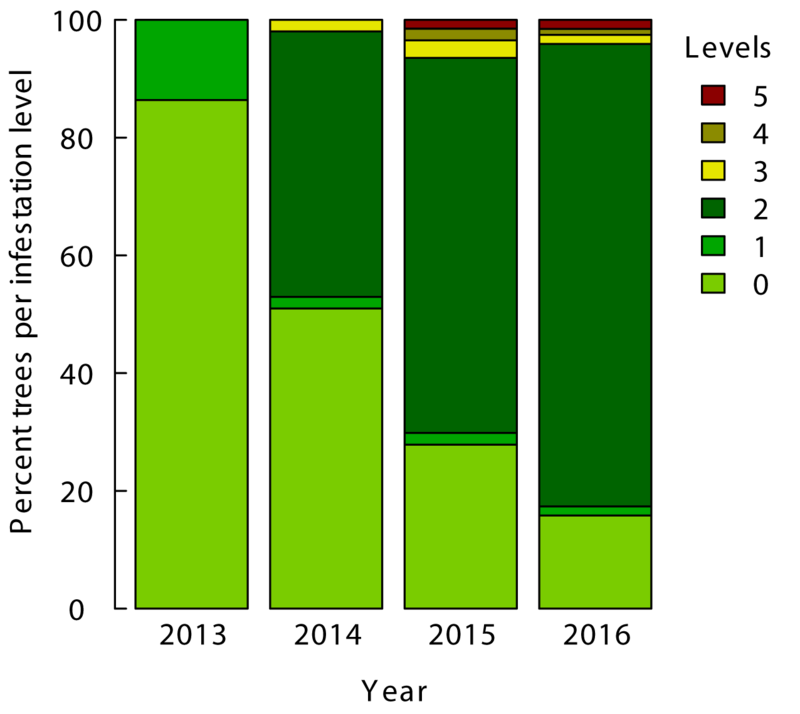 proportion of defoliation classes in all monitoring plots.